The car barreled down the narrow street, which was packed with pedestrians, slamming into a number of them, police said. Tokyo Metropolitan Police said that they have opened an investigation into the incident, which occurred at around 10 minutes past midnight on January 1st. One person, a 21-year-old man, has been detained on suspicion of attempted murder, according to police. 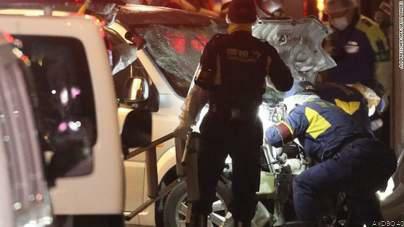 At least nine people were injured, one seriously, when a car deliberately plowed into crowds celebrating New Year's Eve in a central part of Tokyo, according to police. The iconic street is known worldwide as a hub of Japanese youth culture and fashion, and the area famous for its "Harajuku girls," who dress in outlandish, striking costumes. The road was closed to facilitate access to the shrine, which is a popular destination for people on New Year's Eve.